UPDATE: Marikay Abuzuaiter, an at-large candidate for Greensboro City Council who has been targeted by the No Restaurant Tax campaign, told me on primary election night at the Old County Courthouse that she discovered a No Restaurant Tax sign in front of Mahi's Seafood Restaurant, which she owns. It turns out that Marty Kotis, the developer and property manager behind the campaign, is her landlord. Hold the presses: A prepared foods tax/restaurant tax has been proposed for the city of Greensboro? City council candidates have proposed it? For anyone who has spent much time at city council meetings and work sessions or at candidate forums, this news may come as a surprise. At the top of a sample ballot posted on the website, mayoral candidate Robbie Perkins is coded red. Candidates Bill Knight, Chris Phillips and Tom Phillips are coded green. Candidate Bradford Cone is not listed. Marty Kotis, a Greensboro developer who identifies himself as a supporter of the No Restaurant Tax campaign, declined to reveal the source of information relied upon to make the determinations, but several candidates confirmed that they answered a question on the Triad Real Estate and Building Industries Coalition’s questionnaire. Kotis is a member of the NC Restaurant and Lodging Association. His company develops and manages a number of properties across Greensboro that lease to restaurants. Kotis is backing Knight's mayoral reelection bid. 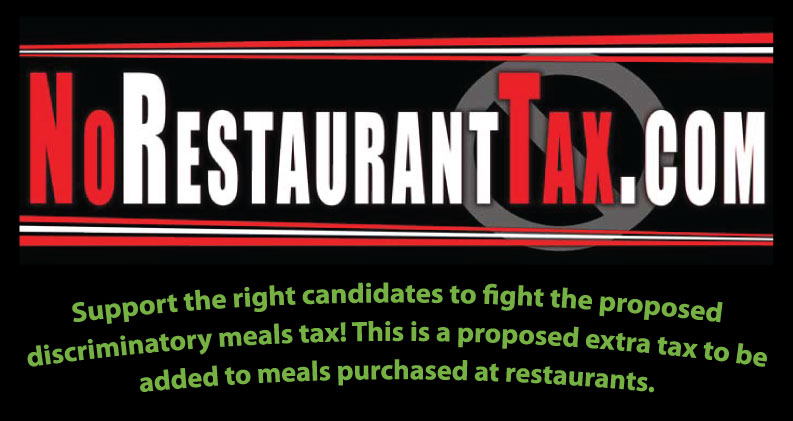 Many of the candidates recommended by the No Restaurant Tax website, including Knight for mayor; Danny Thompson and Chris Lawyer in the at-large race; Mary Rakestraw in District 4; and Trudy Wade in District 5 are self-identified conservatives. But others favored by the group are in the opposing camp, by virtue of their opposition to reopening the White Street Landfill, including Yvonne Johnson and Wayne Abraham in the at-large race. Conservative Jean Austin Brown, an at-large candidate, is listed as being in favor of the restaurant tax. The No Restaurant Tax Facebook page links to a January 2010 article by Fox 8 TV indicating that Perkins proposed an authority to oversee the coliseum. But Perkins has not advocated the creation of a coliseum authority since that time. Last month, he addressed Conservatives for Guilford County and defended the current arrangement in which the coliseum is subsidized by the city of Greensboro’s general fund. Abuzuaiter, who owns Mahi’s Seafood Restaurant, checked off the box on the questionnaire for “yes.” And on a follow-up question asking, “Would you require a referendum?” Abuzuaiter also checked off “yes.” The questionnaire requires either a yes or no answer, and does not allow candidates to indicate they might consider the idea. The questionnaire provides only a small box for candidates to explain their position. Considering that the candidates on the other side of the issue are deemed “good for restaurants” — implying that those who support a restaurant tax in some fashion are not — Abuzuaiter and Hayworth said they view the website as misleading. Abuzuaiter said a typical bill at her restaurant is $40. That means that a 1-cent tax would translate into an additional cost to customers of 40 cents per meal. In District 1, challenger Donnell “DJ” Hardy is highlighted in green while incumbent Dianne Bellamy-Small is coded red. The campaign’s Facebook page links to a blog post by War Memorial Commission member Tony Wilkins, also dating back to January 2010. Wilkins reports that Coliseum Director Matt Brown presented a chart of organizations that would benefit from $9 million raised from levying a 1 percent prepared food tax in Guilford County during a meeting of the commission. Wilkins wrote, “As I was shaking my head no, a current council member sitting behind me asked, ‘Why don’t we do 2 cent?” In a comment on the No Restaurant Tax Facebook page, Wilkins identified Bellamy-Small as the council member who made the remark. Kotis said even though the idea has not been discussed by city council in open meetings or work sessions since January 2010, if the council decided to pursue it after the election it wouldn’t be the first time an issue was discussed behind the scenes before council took action on it. 1. What do you think made TREBIC ask that question on its questionnaire? 2. Do you find it significant that this is a project that Matt Brown advocated last year? 3. Do you find credible Perkins' flip-flop on this issue? Do you really think Perkins can be trusted? Good questions, Joe. I hope you'll take my answers in the spirit of open dialogue rather than use them to ridicule me and the candidates that you oppose. But I offer them all the same. TREBIC represents a number of industries within the broad umbrella of real estate-development, some of which hold opposing viewpoints. Some builders and realtors, for example, might favor a restaurant tax as an alternative to increasing property taxes. Developers such as Marty Kotis, on the other hand, who collect rents from restaurants, will see the restaurant tax as onerous. If I recall, TREBIC's Marlene Sanford has told me that the questionnaire is used to educate member organizations so that members can make their own decisions about which candidates to support. TREBIC, as you probably know, does not endorse candidates. If they did, they'd probably have a hard time making most of their member organizations happy. I'm agnostic on Matt Brown's role in this issue until I know more about the context. As a staff member, he may have felt that it was helpful to provide information about hypothetical means of enhancing revenue. But Matt Brown doesn't hold the power to establish taxes, and it obviously didn't go anywhere. I strongly doubt that Perkins was ever serious about creating a coliseum authority. I'm relying on memory and some intuition here, but I understand this as a ploy to co-opt and dismantle his political rival, Bill Knight's causes. Knight was interested in privatizing the coliseum early in his term. Perkins suggested an authority as a vehicle to accomplish Knight's goal, and then argued that this structure would require a different stream of tax revenue. Suddenly the authority option didn't look so attractive, and the idea was dropped and never heard of again — until now. Perkins never wanted an authority. He wanted to derail Knight's plan. And that's what he accomplished. Trust in politics is relative. I trust him enough to vote for him. I've always tried to hold him accountable, and I think if you pulled all the articles I've written about that, you'd see that I have a track record of doing that. Wilkins' post is almost two years old. Since that time Brown oversaw the successful completion of the Aquatics Center and Ampitheater. A prepared food tax was never mentioned to offset the costs. This is a made up issue. If Brown had really advocated for a "restaurant tax" he wouldn't have stopped at the commission meeting. In fact, at the C4GC forum, Perkins mentioned the idea of an authority for the Coliseum, and did not speak in an unfavorable way about it. I don't think that he is opposed to the idea of a Coliseum authority. In fact, I think he would like the idea if it is attached to a built-in source of revenue. The restaurant tax could be used to pay for future toys-- for instance, a performing arts center that various parties want to resurrect. Or I suppose it could be used to help pay down debt. My theory is that TREBIC's question must have come from somewhere. Someone has an idea with regard to how that money can be used. There would be no need to raise property taxes necessarily unless new projects or other new spending is being envisioned. "I was on the minority end of a vote to privatize that facility in the 1990s. But since we couldn't get it privatized we decided to run it as best we could as a city facility. The only way to rid ourselves of the coliseum is to set up an authority, but that authority has to have revenues to subsidize the facility. You look at coliseums nationally and without anchor tenants such as professional hockey teams and professional basketball teams taking a large majority of the nights each year, they lose money. So we're providing a huge service to this community, driving the tourism business in this community and providing an entertainment option for those that live here, in the Greensboro Coliseum. So I don't see those losses at all, Mr. Cash." Donnel "DJ" Hardy candidate Greensboro City Council District 1, was omitted from this column and possibly your survey. Democracy requires an objective press whose mission is to keep we the people as fully informed as possible. Donned "DJ" Hardy is a viable candidate and deserves to be covered as such. I'm really torn between Joe's characterizations and Jordan's direct quotations -- not. I suppose we should just disregard the fact that Perkins made this proposal, and that his response to the TREBIC questionnaire is not inconsistent with the fact that he made that proposal; and that he has not been opposed to the idea of a public authority running the coliseum funded at least in part by a restaurant tax. In fact, he has spoken in favor of that concept. I can understand that he might have a motive to explain away his position, and that you might have a motive to help him do so. But let's not ignore the record staring us in the face in favor of artful explanations.